In these report cards, immediate visual results are shown as dots. Mental health metrics unique to one year or the other followed that but were not common to both years so they were isolated at the bottom. Geography is shown left to right starting with BC on the west coast, and going to NL on the east coast just like a map. Highest level of education attained. This shows how one demographic is doing across the provinces, for all the indicators. Change the year in the menu at right if you want to see 2015 results. The choice of "change" shows you what has changed to a statistically significant amount. In this report card, one can quickly see lots of red dots vertically in NL and NS, indicating poor performance in many categories among all those surveyed (12+ years old of both genders). Both have clusters around poor physical health with chronic diseases and poor lifestyle habits. BC, meanwhile, is doing fairly well with lots of green dots, whereas QC seems to be either worse or better than the national average with relatively few grey dots. There were no sums done of different types of dots because few people would consider all these categories to be equal in any way. Scanning across a metric might show you if any province or two might be skewing the data, if there were an imbalance of red to green dots. Not nearly as interesting as the vertical clusters but possibly insightful for some things. This shows which demographic/s in which province/s are doing well, or not, compared to the national average, for whatever metric chosen. BC residents did the least heavy drinking among provinces, by a clear shot, both years. Looking across the rows, you can see if any demographic were generally doing better or worse than others across the country. Nothing really showed up for heavy drinking. It's more a provincial thing than a demographics thing. Change the metrics and see what trends you see in other metrics. 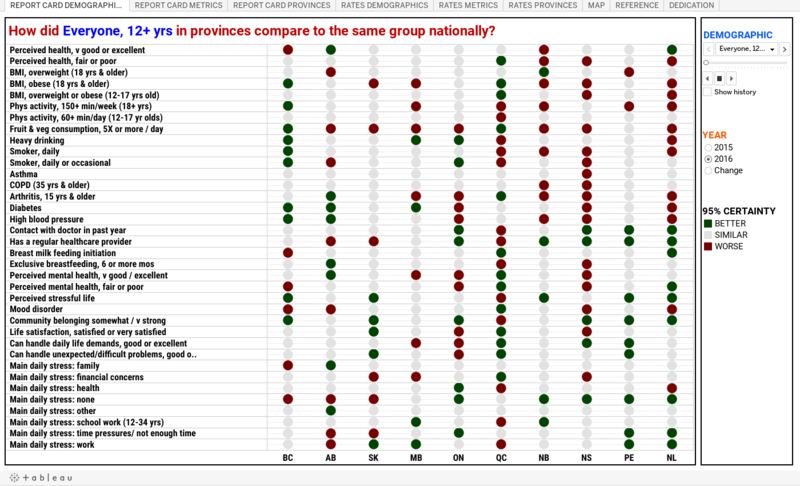 In the provinces report card, you can see which demographic/s are doing well, or not, among which metric/s. For NS that is the default value, there are a LOT of red dots. They cluster around physical health and lifestyle choices, generally, in terms of rows that affected every demographic in the same way. The exception being rather interesting that obesity rates among adults of the two lowest income quintiles were better than the national average! While causality is definitely not possible to tell from these dashboards, the hypothesis that fewer of them may have cars and need to bike or walk around more is tempting for being plausible. Change the provinces and see how true that might be! As for specific demographics, the ones encompassing all age categories seem to be doing worse. Seems like each age group demographic contributes the odd one or two unique poor results different from the others, so that when combined, the entire group seems to be doing worse in more metrics. Also interesting in NS is that among the income quintile demographics, none seems to be that much better or worse off than others overall. Income difference is generally the main determinant of health, but at least not in the 2016 sample in NS. Change provinces to see if it might be clearer in other provinces. 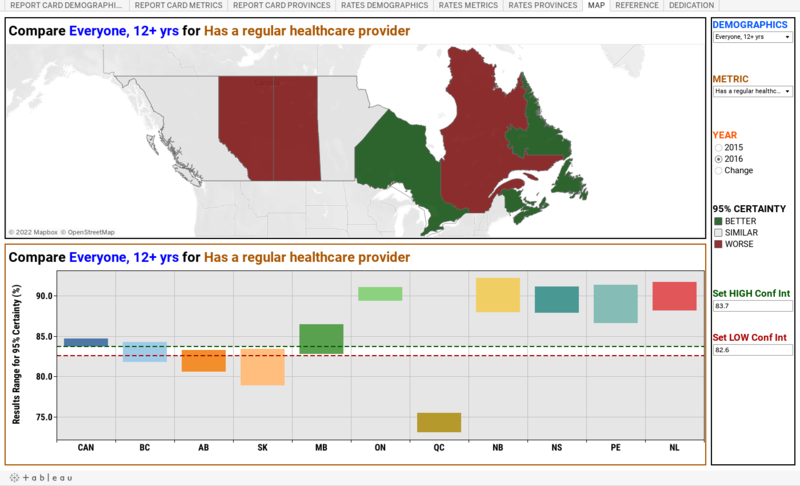 This dashboard shows rates for a chosen province and metric, with confidence intervals.  You can choose whatever values you like, along with a high low range represented by the dotted line. However, he idea was that you'd compare the same metric among two provinces, then set the high and low range to be equal or identical reference lines in both graphs, to see which demographics stand out, or how rates generally compared numerically, rather than the report cards that only showed the results in terms of dots. Values were present if you hovered your pointer over the dots, but you'd only be able see one result at a time, unlike these "rates" dashboards. The dotted lines were set for 2015 comparison where most of NL's results had some part of the confidence interval within the lines. Contrast that to BC where all results were well below the minimum threshold line. It was a clear cut difference across all demographics. There is no data if the Year is set to "change" because that was for a comparison of statistical significance, not numeric results. However, you can make two identical graphs aside for the year, to see how the bars have changed from year to year for a given metric in a given province. This would only give a view of the relative difference among rates for all the metrics. Changing any variable won't change the sliders too much for any metric for any group. It just shows which rates are high, and which are low. This shows different rates among the provinces for any given metric and demographic. 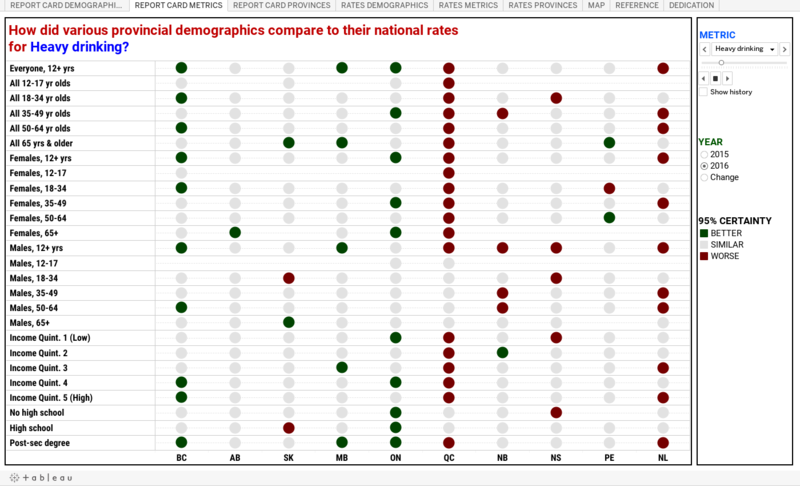 It works in the same way as the Demographics Rates Dashboard, except comparing provinces instead of demographics. Isolating the same demographics, but with related metrics to see if some visual correlation might be present (not statistical as no calculations done) would be interesting, or just to see who has the highest rates of something. NL, despite their general poor health compared to the rest of the country as mentioned above, definitely have a strong communal bond they are proud of, and the results show with the highest sense of community belonging scores. The other Atlantic provinces tend to claim the same thing and they also had relatively higher scores. If nothing else, testing out stereotypes or perceptions, using these dashboards can be interesting on its own! The map dashboard is a combination of report card shown as a map with provinces coloured as their dot results would have been, at the top of the dashboard, and a rates graph for the same indicator and group, at the bottom to show the numerical results of the report card comparisons in the map. In terms of having a regular healthcare provider, which is not the same as a regular doctor (a question that used to be asked in that format), the Atlantic provinces and Ontario are above the national average. You make what you want of it. I just had enough good causes to put the effort into creating it. I don't check this blog daily, but if I see questions, I'll do my best to answer them whenever I get the chance. Thank you and I hope you will find the tool I created to be helpful. If you want to see CCHS results for the 2015-16 years combined that allowed for results in Census Metropolitan Areas (CMAs) and health areas (zones, unit, etc. ), please click here.